uuid : 574b4e66-2c11-468b-8c45-efe8033d4a87 templates_id: 119570 templates_uuid: "dd313fd5-0acf-47b3-92cf-898e931df168" title: "Dissolution of Partnership Deed - Partnership Dissolution" display_name: "Dissolution of partnership deed" meta_keywords: "Dissolution of partnership agreement and Partnership dissolution" description: "
Follow proper process when you and one or more other individuals carrying on a business in partnership have agreed to bring the partnership to an end with this dissolution of partnership deed. This partnership dissolution form outlines all the important details regarding the dissolution and winding up of the company. In particular it covers the date on which the partnership will cease trading, what the partners can and cannot do from the date of dissolution, the discharge of the partnership\'s liabilities, and the retention of records. What is a dissolution of partnership deed? A dissolution of partnership deed is a document whereby business partners decide to terminate a partnership. It sets out the terms under which the partners agree to dissolve and wind-up the partnership, and outlines each step of the dissolution process. Why do I need a dissolution of partnership deed? A dissolution of partnership deed enables the partners to end the partnership fairly and transparently, as it determines how the business assets and liabilities will be divided between the partners. The dissolution date is the date on which the partnership will cease to exist - ie the relationship between the partners terminates. After this date the partners will complete any unfinished work, settle any liabilities, realise any partnership assets and otherwise wind up the partnership. The winding up date is the date when the winding-up of the partnership is completed. How should the amounts held in the partnership accounts be distributed? for dividing any balance between the partners. How should the partners share any money left in the partnership accounts after settling all outstanding payments? in the same proportions to the amounts in the partner\'s respective accounts. How long should the partnerships records be kept for? One of the partners should be responsible for looking after the accounting records, letters and other documents for the required period of time. This deed states that the partnership records should be kept for 6 years after the date the winding up of the partnership is completed. This dissolution of partnership deed is governed by the law of England and Wales.
" created_timestamp: "2018-10-08 04:37:01.0" modified_timestamp: "2018-10-08 04:37:01.0" active: true created_by: 104 modified_by: 104 dcm_id: 291 url_slug: "Dissolution-of-partnership-deed" meta_description: "Let Rocket Lawyer help you prepare a dissolution of partnership deed. Follow proper process when you and other individuals who are carrying on a business in partnership want to bring the partnership to an end. Try this partnership dissolution form." time_to_complete: "15 minutes"
Follow proper process when you and one or more other individuals carrying on a business in partnership have agreed to bring the partnership to an end with this dissolution of partnership deed. This partnership dissolution form outlines all the important details regarding the dissolution and winding up of the company. In particular it covers the date on which the partnership will cease trading, what the partners can and cannot do from the date of dissolution, the discharge of the partnership's liabilities, and the retention of records. in the same proportions to the amounts in the partner's respective accounts. More than just a Dissolution of partnership deed template, our step-by-step interview and guidance makes it easy to create your document. Easily create online, download, print and sign your free Dissolution of partnership deed in minutes. 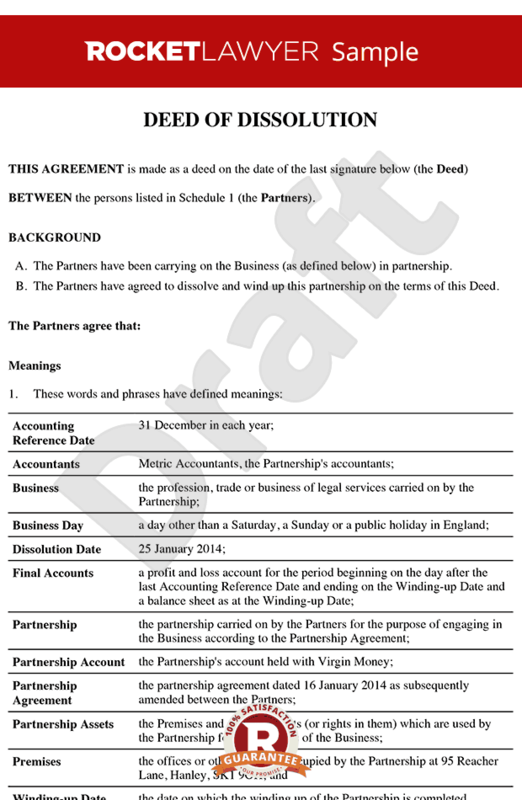 This document is also sometimes called: Dissolution of partnership agreement and Partnership dissolution.